If there was a predominant recurring theme in this blog, and in my drinking life, back when it first started in 2005, it was the search for, or re-creation of, vintage cocktail ingredients that were no longer obtainable. Arrack Punch, or Swedish Punsch, is still in the work-around category for now, but since it’s traditionally a homemade concoction, you don’t have to worry about authenticity of flavor. For the past couple of years, ever since Erik Ellestad passed along his recipe for our “Make Your Own Ingredients” session at Tales of the Cocktail, I’ve been working off batches of his early version of Underhill Punsch, made with a base of rum (usually Jamaican, though Demerara can be an interesting detour) pumped up with Batavia arrack, the booze briefly infused with sliced lemons and sweetened with a syrup made with sugar and tea spiked with cardamom. Easy, easy. But my bottle of homemade Swedish punsch recently ran low, right about the time that David Wondrich’s new book, Punch: The Delights (and Dangers) of the Flowing Bowl arrived in the mail. I’ve got a longer write-up of Dave’s book planned, complete with recipes for the punches I drank too much of at his Seattle book party on Tuesday night. But one of the recipes that caught my attention while reading the book was one of the simplest and most familiar, in a way: that for Cozzen’s Arrack Punch. 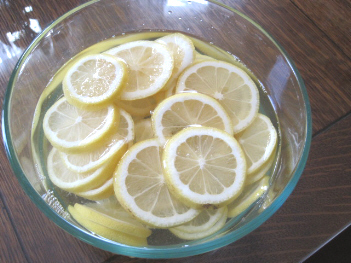 Thinly slice the lemons and let them soak in the arrack for 6 hours. While you wait, make a syrup by combining the sugar and water over medium heat, whisking until the sugar is completely dissolved; let the syrup cool before using. At the end of the soak time, gently strain the fruit from the liquid, taking care not to press or crush the fruit or do any of the other things you’re accustomed to doing when removing fruit from an infusion. Combine the syrup with the infused arrack and store in a jar. After a few days have passed, filter the punch for particles and sediment, then bottle and store. Yes, it’s sweet, but that’s the point — you’re basically using this as a liqueur (or, if serving it on its own, you’re diluting it down so the sweetness is more manageable). Anyway, now that you’ve got this stuff lying around, here’s a fine drink in which to use it: the Diki Diki. Diki-Diki is the chief monarch of the Island Ubian (Southern Philippines), who is now 37 years old, weighs 23 lb., and his height is 32 in. The author introduced this cocktail at the Embassy Club in London, February, 1922. Shake well with ice and strain into chilled cocktail glass. Done. I really, really enjoy this drink. 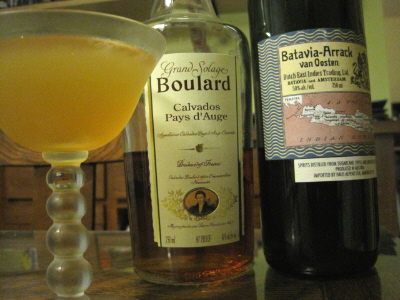 First, Calvados has a robust quality that carries over well even with sours; it gives the drink some gravitas, without being overwhelming or uncomfortable in the role as big-character whiskies can sometimes be. Between the grapefruit and the punch, there’s a complex ranginess in the drink, with the raw, gamy quality of arrack just barely held in check, where it can throw little barbs of funk into the drink without being offputting. As Josey Packard said when Erik mixed one of these with her, the Diki Diki is a very grown-up drink — this isn’t really for a novice, but at the same time it’s not quite as out there as some of the drinks making the rounds nowadays.